Aussies have great potential to be wonderful companions for children. They are devoted dogs who will bond strongly to family members. But, a lot of how well that relationship with children will go depends on the dog, and even more so the owners and parents of the children. If left to their own devices, not all dogs and not all children will get along. Part of that may be that kids don't know the proper way to interact with a dog, and some of their behavior will stress or upset the dog. 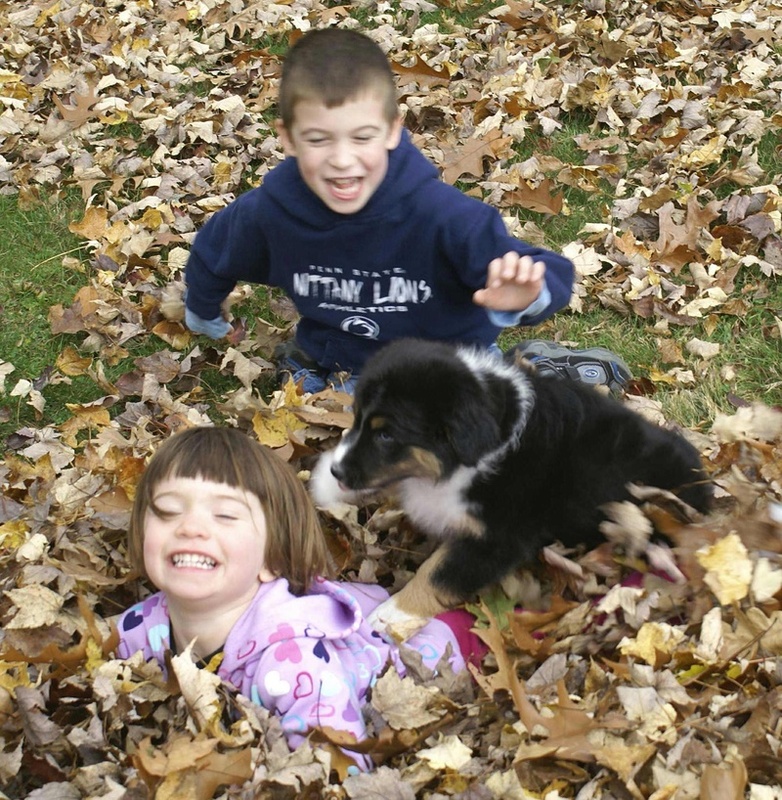 Even worse is a child who purposefully teases a dog. Aussies are very intelligent and they don't forget such behavior. Worse yet, they may generalize and be reactive to children who resemble the one who teased them, or all kids they see. I always urge owners not to leave their Aussie unsupervised in the fenced yard, if there is a chance neighborhood kids may tease the dog and teach it to distrust all children. Since Aussies often have strong herding instinct, and often an urge to "control chaos" and correct perceived misbehavior, they can sometimes get in trouble if not properly guided by responsible owners. The dog may want to chase running, screaming kids who are playing loud and rowdy games. They may want to nip or bite the friends of the family children, if they think the games are too rough and their kids are at risk. They may think some of the normal, boisterous behavior of children, especially boys, is out of line and want to step in to correct this. This is all normal Aussie and normal dog behavior, but it doesn't mean it will be tolerated or understood by many owners. 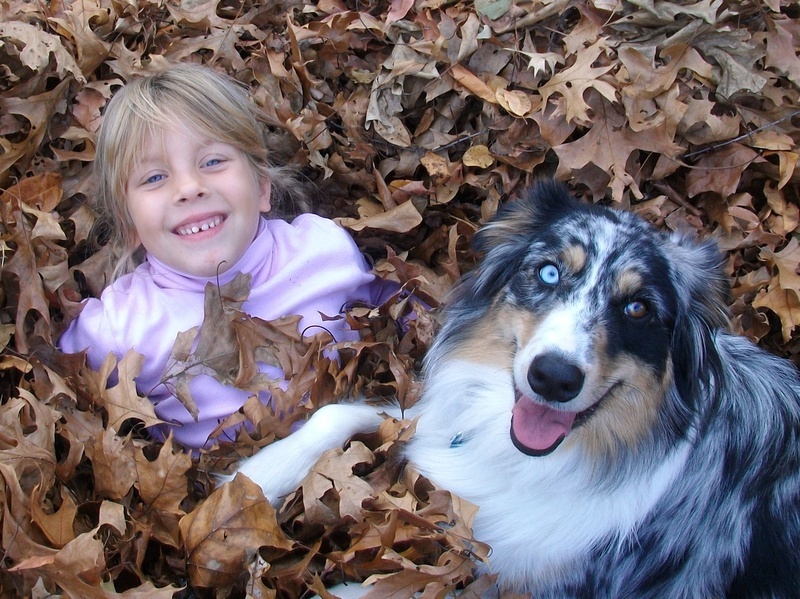 So if your family includes children of any age and you plan to add an Aussie, be aware that it will take a good bit of work on your part to properly manage your human children and the family canine. A lot of what your adult dog will do will depend on how he is raised, as well as the genetic temperament he inherits from his parents. If from puppyhood on he is not allowed to chase feet and nip at heels, he will be less likely to try it as an adult. You can use a leash on an Aussie at any age to help manage the urge they have to do that. If the kids are going to play active games, a good puppy training game is to have the puppy sit with you, on leash, and practice keeping his attention on you, in exchange for high value treats like bits of chicken. He will learn that running, noisy kids means good stuff will happen from YOU, and that he doesn't need to be bothered by practicing bad behavior (from your perspective, not his, as chasing and nipping running creatures are what he was bred for)! The same can be true when your kids have friends over. After the puppy is good at focusing on you during more active times, you can start to have your kids and your kids friends feed treats for calm, non-chasing behavior. Make it a game, "reward the puppy for sitting, not chasing." It will also help the puppy to enjoy the visits of new people, which furthers the socialization process. Some Aussies go through "fear periods" or shy stages as they grow, and making interacting with new people fun and not stressful will help the pup maintain and gain confidence through any such stages. If at any time the situation becomes too overstimulating for a puppy, don't be afraid to remove the pup from the room or yard, and give him time to settle down. Being removed is better than giving the pup a chance to practice behavior you don't want to see. If you think things are getting to the point you don't know how to train or manage the situation, don't be afraid to seek the help of an experienced canine behaviorist, who can visit and observe interactions in person, and come up with a plan to help get things back on track. There are a number of good books out there that pertain to raising dogs to be good with children. The more you take the time to understand your Aussie and how he thinks, as well as to manage his behavior and the kids' behavior, the better success you will have in having a big happy family! For everyone who asks receives. and he who seeks find, and to him who knocks it shall be opened."